REVIEW: The cozy Soul Taco brings a fresh flavor to Second Street | Food and Drink | Style Weekly - Richmond, VA local news, arts, and events. Scott Elmquist With fillings like chicken-fried carne asada, at left, and cornmeal-crusted catfish, Soul Taco serves classics with a twist. On an almost deserted block of Second Street, a tiny storefront has been recently revamped into a bright shiny penny. Soul Taco is exactly what it sounds like, bringing the influences of the area — soul food inspired by the history of Jackson Ward — to the trendy Tex-Mex staple and your boyfriend's favorite food: the taco. Though the space is cozy and narrow, the atmosphere is warm. Decor is cute and clean, with hanging planters and strings of lights draped from the ceiling. One wall showcases a gallery display of frames: sketches of tacos, a pop art treatment of Frida Kahlo, vintage photos of Jackson Ward and quippy, uplifting sayings written in calligraphy. There are four tables and a high top with sunny yellow stools for four. Orders are placed and paid for at the cash register, and a server brings plates out as they are ready. One server manages the needs of everyone with a friendly demeanor while R&B hums in the background. Soul Taco's game is small bites with fresh ingredients. Chef Ari Augenbaum has created a menu of carefully curated tacos as well as a smattering of Southern snacks with a Mexican finish. Where do they fall on the varied Richmond spectrum of Boka to En Su Boca to Don't Look Back? That may differ depending on who you ask, but I will say Soul Taco's offerings stand up against local favorites. The pulled pork carnitas ($3.75) is a good place to start, garnished with red cabbage slaw, cilantro and sour cream. The chicharrones on top are tough on the teeth, but the rest of the taco is solid. Consider pairing it with a side of roasted corn on the cob, or the Elote Local ($3). The medley of cilantro, lime, Cotija cheese and agave hot sauce on top make it one of my favorite things on the menu. A vegetarian option of the roasted sweet potato and black-eyed peas taco ($3.75) sounds enticing and has a dynamic flavor, but the mushy sweet potato needs more bite to it — more texture. Fusion concepts often beg the question, "Do these two things actually taste good together?" At Soul Taco, the result is a mixed bag. Take the Low Country Camarones ($3.75). A flour tortilla combines Old Bay-sauteed shrimp, bits of chorizo, mashed potato and corn in one savory, comforting bite. Yes, this iteration of the South Carolinian tradition absolutely works in a taco. So does the cornmeal crusted catfish taco ($3.75), which mixes crispy chunks of catfish with a tomatillo salsa. The corn crunch brings the soul and the salsa caps off an inventive nosh. Another success story is the chicken pot pie tostada ($3) with shreds of braised chicken, bechamel and hot sauce. Order this. The chicken fried carne asada ($3.75) features cilantro-lime marinated steak, pico de gallo, roasted red pepper and avocado, but the steak was tough and the combination didn't give me that Southern-fried paradise I was hoping for. The hush puppy nachos ($4) are tempting, but they don't quite impress. Topping something with guacamole, though not a bad idea, doesn't always save a dish. A few dense hush puppies are doused in a chipotle cheese sauce and sprinkled with black-eyed peas, red onion, guacamole and sour cream. But the hush puppy requires a knife to break apart and the cheese could benefit from more zest. Similarly, the smoked mac and queso-dilla ($4) is more of a novelty. Yes, this version of the cheesy pasta is smoky, but whether it is any more enjoyable toasted between miniature tortillas is up for debate — and I don't know that guac can salvage this one either. Soul Taco does not serve alcohol, though the Virginia ABC website shows a pending mixed beverage license in the restaurant's name. There is, however, luscious limeade ($2) with free refills. Presentation and ambiance is meant to be casual, but at such an adorable little establishment that looks straight out of ApartmentTherapy.com, the eats could benefit from some decent plates. Tacos and sides appear from the kitchen in small metal mixing bowls and industrial metal trays that seem to be cast-offs from an old cafeteria. While Soul Taco may not be destination dining, it is a quality lunch spot for those on Broad Street or near the Greater Richmond Convention Center looking to duck in for a snack. 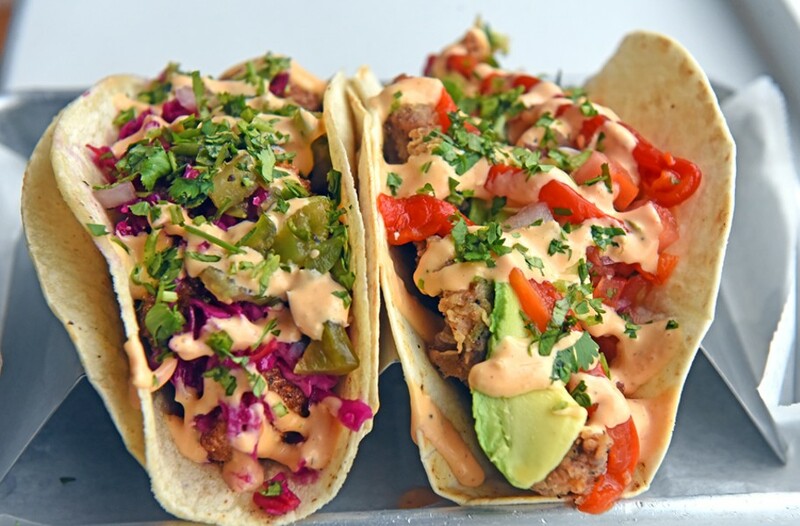 Soul Taco brings new life to a block that has been largely dormant, and joins nearby Salt and Forge, J Kogi and Lucy's in adding small business and big flavor to the neighborhood. Mondays - Saturdays 11:30 a.m. - 9 p.m.
Sundays 11:30 a.m. - 3 p.m.